Sadillac, situated 17km from Bergerac and 13km from Eymet, is a rural commune with a surface area of 563 ha and a population of 107. Situated on the edge of the village of Sadillac, 5 km to the south of Château de Monbazillac, and the less famous, but more beautiful Château de Bridoire. Château de Sadillac is only 15 km from Bergerac and the Dordogne river, superbly situated to explore the countryside, wine, food and history of South West France. Château de Sadillac’s history goes back to the 12th century when it was an ancient fortified Priory. In the middle-ages Sadillac was a fortified village surrounded by ramparts. Between 1405 and 1569 Thomas head of the protestants razed the village to the ground after a ferocious battle, leaving only the apse of the church and the ancient fortified Priory – the Château – in which he lodged his garrison. Today, the ground-floor and tower, which date back to the 12th century, still exist, along with the Church at the side. The upper levels of the Château date back to the 16th Century and the whole has been fully and sympathetically restored. The human presence in Sadillac is very ancient (carved stones, flint, ..) The very name of Sadillac comes from a Gallo-Roman villa belonging to one named Satellius; This name identifies a satellite, a veteran mercenary of the Roman armies rewarded for his loyal services. In April 1079, for the first time, the name Sadillac appeared in modern history; The text in question is a title of donation made by the Duke William VIII of Aquitaine (1023 – 1086) to the monks of the abbey of Moissac, charged to the latter to celebrate each year a mass for the parents of the Donors (Guillaume V and Agnès de Bourgogne). The monks cleared, scoured, cleared the forests to develop the land around them. On September 19th and 20th, 1304, the Archbishop of Bordeaux, Bertrand de GOT (who became Pope Clement V the following year) came to Sadillac to preach the word of GOD. Around 1340 the monks were replaced by a prior appointed alternately either by the bishop of Agen or by the one of Sarlat. Soon after, a second village wall was built to defend the city, at the very beginning of the Hundred Years War. At the end of the fifteenth century, a prior transformed the monastery into a priory. 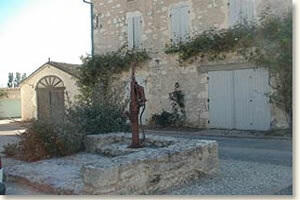 On August 8, 1565, the whole court of France crossed Sadillac on the road from Lauzun to Bergerac. There are Catherine de ‘Medici, Charles IX., Princes, lords and servants, guards and escorts with carriage horses and carriages, nearly 6,000 persons. Four years later, in May 1569, a Protestant army from Bergerac attacked the town of Sadillac and “after a terrible battle” captured it and shattered the houses, blew up the church and kept only the South wall as a point of support for the garrison installed in the priory. The town of Sadillac never recovered from this fatal day, the church was rebuilt only about forty years later, at the beginning of the seventeenth century. The priory, now called Chateau de Sadillac, was sold as national property in 1792 and its new owner turned it from a three into a two-storied building, lowering the south-facing tower by about 6m. The Church, called St Anne’s (listed as an Historical Monument in 1957). Renovated in 1995-1997. The village square was renovated in 1999. The church belonged to the priory and although its date is unknown, the oldest, right-hand side dates from at least the 13th century. The church, which is dedicated to St Anne, is 21mtrs long and 6mtrs wide and has only one nave. The original architecture was Romanesque-Byzantine. The right-hand wall is especially remarkable due to its groups of clustered columns, some square, some round, topped by carved capitals which, despite their poor condition, are still of particular interest. 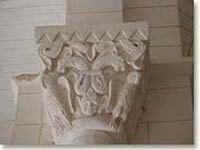 Sculpted imaginary beasts, fish and other symbols commonly used in the 13th century can still be discerned under the capitals. The belfry, door and rest of the church are of less interest dating only from the Renaissance. Sadillac church harbours some of the most beautiful capitals in the Bergerac region. There are two main springs. One on the golf course, on the back wall a scratched Greek cross dating from the 13th or 14th century (or the imitation of just such a cross).